Jet lag. With the nine-hour time difference between San Francisco and Copenhagen, a bit of shut-eye during our recent trip there just wasn’t happening. I got out of bed, walked quietly to the kitchen and began to stir a dough together. Baking usually helps when I can’t sleep. A few years ago, when I lived in Denmark, I baked a lot, especially during the cold winter months. Essentially, it was the baking (and the cold-water polar plunges) that got me sanely through most of those long and dark wintry days. The dough I was making that night was for Shrovetide—Fastelavn, in Danish—buns. Even though Shrovetide isn’t until February, I’d already seen them displayed in the window of a local Danish bakery. The sweet, custard-filled, cardamom-scented buns are a favorite of many, my family included. Years ago, my very first effort at making these buns was a true make-it-or-break-it situation. At the time, I’d only lived in Copenhagen for a few years, and worked as a chef in a school kitchen making food for 240 kids daily. One day, the head of the school approached me and told me about Shrovetide being a festive tradition at the school. On that day, all the children dress up in costumes (like on Halloween), swing bats at candy-filled hanging barrels (like piñatas) and eat these luscious buns as an afternoon snack. She asked me kindly if I could bake the buns, and intrigued, I said yes. 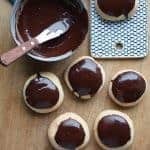 I read recipe after recipe, not feeling I’d completely understood the way to enclose the custard in the center of each bun. (My Danish was admittedly not very good at this point.) I called my Danish mother-in-law for guidance, and sensing my anxiety, she offered to help bake the big batch with me. This story has a happy ending: the 240 children got their sweet buns (can you even imagine if I’d failed! ), and I learned a new baking technique that I now can use to brighten up any cold and bleak winter day, even here in San Francisco. Make the dough. In a small saucepan, warm milk gently to about 105–110°F. Remove from heat and whisk in yeast until dissolved. (If your milk gets too hot, let it cool down before adding yeast.) Set aside. Pulse flour, salt and cardamom in food processor to combine. Pulse in butter until it resembles coarse meal, about 20 pulses. Empty mixture into bowl of stand mixer. Add sugar, egg and milk/yeast mixture. Using the hook attachment on medium speed, mix dough together until well combined, about 2 minutes. Cover bowl with a towel, place in a warm spot and allow to rise for 30 minutes. Make the custard. In a small saucepan, whisk together eggs, sugar, cornstarch and vanilla. Add the milk. Heat the mixture over low heat until it comes to a complete boil, whisking constantly. Remove from heat and allow to cool to room temperature. Preheat oven to 375°F. On a lightly floured surface, gently roll out the dough to a rectangle approximately 17″ x 13″. Cut a 3 x 4 grid on the dough. Divide the custard evenly among each square, about 1 heaping teaspoon per square. Carefully, gather two opposite corners of each square up over the custard and pinch to fasten. Repeat with remaining two corners so that all four corners meet. Pinch the side seams together so that no custard will escape during baking. Turn the dough over in your palm and ensure that the bun is smooth-looking and round and place on a parchment-lined baking sheet. Repeat with remaining squares. Allow buns to rise for 30 minutes. Bake until pale brown, about 15 minutes. Cool buns on cooling rack to room temperature. Make the icing. Sift together the confectioners sugar and cocoa powder in a medium bowl. Slowly stir in the water and vanilla. 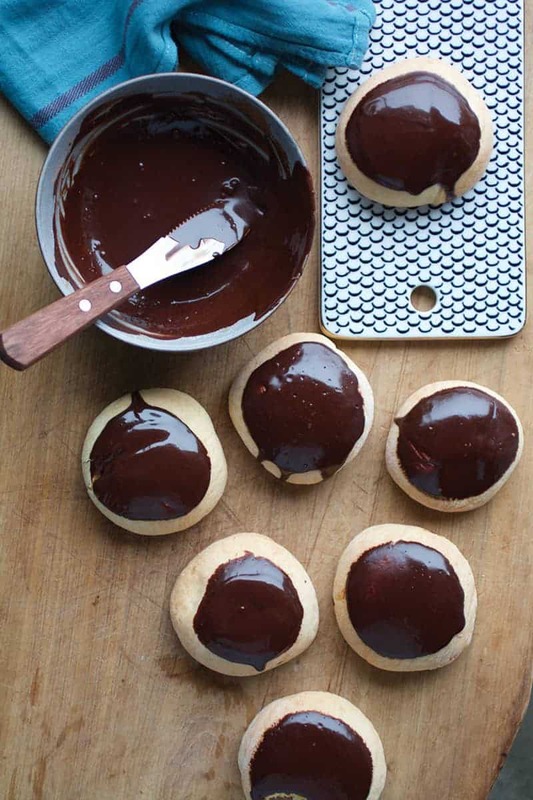 Dip the tops of each cooled bun into the icing and allow to set briefly before serving. These buns taste best when they are eaten the same day. Here’s a quick video tutorial from Nichole on how to fold the buns together!